Studio 58 presents original musical The Park, an updated and full-length version of the same-named one-act that debuted last spring. The Park pits evil developers against idealistic environmentalists in a battle for Vancouver’s own Stanley Park. Joel Ballard and Amy Hall-Cummings share a kiss in Studio 58's The Park. Written by Benjamin Elliott, Anton Lipovetsky and Hannah Johnson. Directed by David Hudgins, musical direction by Benjamin Elliott and Anton Lipovetsky, choreography by Kayla Dunbar and featuring drummer Spencer Schoening. Set design by Bryan Pollock and costume design by Marina Szijarto. Starring Joel Ballard (Triple Sensation), Matt Beairsto, Paula Burrows, Mélanie Desbiens, Stephanie Elgersma, James Elston, Dustin Freeland, Amy Hall-Cummings, Caitlin McCarthy, Graeme McComb, Carlos Rodriguez, Gili Roskies and Kendall Wright. Studio 58 and Langara College present The Park from September 30 – October 17, 2010 at Studio 58, Langara College, 100 West 49th Avenue. Tickets are available online or by calling 604-684-2787. The quality of student productions can often be more miss than hit, so I was pleasantly surprised by Studio 58’s farcical musical Where’s Charley? Adapted from Brandon Thomas’ 1892 play Charley’s Aunt, the stage musical version starring Ray Bolger (The Wizard of Oz) premiered in 1948 with a book by George Abbott (The Pajama Game, Damn Yankees) and music and lyrics by Frank Loesser (Guys and Dolls, How to Succeed in Business Without Trying). Benjamin Elliott and Graeme McComb in Studio 58's Where's Charley? Photo by David Cooper. Despite its pedigree, Where’s Charley? has mostly slipped into obscurity. 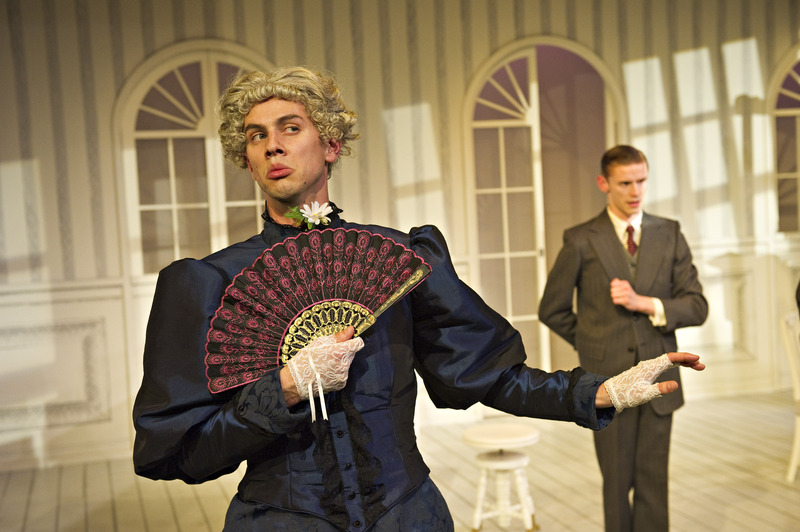 Set at Oxford University in Victorian era 1892, college seniors Charlie Wykeham (Benjamin Elliott) and Jack Chesney (Graeme McComb) are awaiting Charley’s wealthy aunt Donna Lucia D’Alvadorez (Joy Castro) who will serve as the required chaperone when they have tea with their respective intended love interests, Amy Spettigue (Caitlin McCarthy) and Kitty Verdun (Amy Hall-Cummings). His aunt does not arrive as scheduled and rather than cancel the planned date, Charley dons a costume and disguises himself as Donna Lucia. Assorted mayhem and high jinks ensue. The musical suffers from a slew of pointless and forgettable songs. “The New Ashmolean Marching Society and Students’ Conservatory Band,” in the first act inexplicably trots out a student marching band which mercifully leaves as quickly as it first appeared. Just as out of place is the bizarrely placed “Make a Miracle,” where Charley and Amy sing in counterpoint about their future; he tries to propose while she imagines what technological advances the 20th century will bring. Fortunately, the snappy dialogue and tried-and-true physical comedy gives the actors ample room to make up for the show’s weaker points. Though Charley could never credibly pass as a woman, his strutting drag act is a tonne of laughs. In what is easily the highpoint of the evening, Elliott (sans dress) wins over the audience with “Once in Love with Amy,” soft shoeing and crooning with an easy charm. Lighting design often goes unheralded, since it is mostly only noticed when something goes wrong. Here, Darren Boquist’s lighting choices are distractingly obvious and sometimes over handed. Luckily, Pam Johnson’s set looks good in any light. It is crisply picturesque and a vision in white, accented sparingly with bursts of red or green. Not much more can be said about this show; it’s fun and airy but ultimately forgettable. While a bright future on the stage for much of the cast seems assured, Where’s Charley? is likely destined to sink back into the obscurity of the history books. Posted in Musical Theatre, Reviews, Studio 58, Vancouver, Where's Charley? Tagged Amy Hall-Cummings, Benjamin Elliott, Brandon Thomas, Caitlin McCarthy, Charley's Aunt, Darren Boquist, Frank Loesser, George Abbott, Graeme McComb, Joy Castro, Langara College, Pam Johnson, Ray Bolger, Studio 58, Where's Charley?